Pediatricians measure a child's growth not only by weight and height but also by skills mastered. These skills often develop at predictable ages and go by the term developmental milestones. Toddlers have a wide range of normal, according to the BabyCenter website. Don't worry too much if your toddler's development does not exactly match the milestone charts. Every child develops differently. Even children in the same family may develop at different rates. A typical toddler at 21 months may be ahead in some milestones and behind in others. Gross motor skills include walking, running and climbing. Your 21-month-old should be ready to begin or have already completed the following skills: walk alone, pull a toy behind while walking, carry a large toy while walking and begun to run. In addition, she should kick a ball, climb on and get down from furniture without aid and walk up and down stairs with support. If your 21-month-old has not begun walking, let your pediatrician know. Fine motor skills include picking up small items and drawing. At 21 months of age, a toddler should be ready to begin the following skills: scribbling without help, turning over a container to dump the contents and using blocks to build a tower of at least four blocks. A child of this age might use one hand more than the other. A toddler showing a loss of skills previously acquired should cause concern. Cognitive skills include thinking, reasoning and using the five senses. A 21-month-old should have begun or already gained the ability to sort blocks or toys by shape and color. He should not have a problem finding a hidden object, even one that has been placed beneath several covers. Most children around this age begin to explore make-believe play. If by 21 months of age, your child does not seem to know the function of household objects, such as a phone, fork or a brush, consult your pediatrician. Language develops over the first few years. A toddler by the age of 21 months should have the ability to say several words. By 24 months, the following skills should be complete: recognizes the names of familiar people, objects and body parts, uses simple phrases and two- to four-word sentences and has the ability to follow simple instructions. In addition, a 21-month-old should begin to name objects that you point to. Playing with other children is a developmental milestone. Don't expect your toddler to have this perfected for a while yet, but he should show an increased interest in the company of other children. 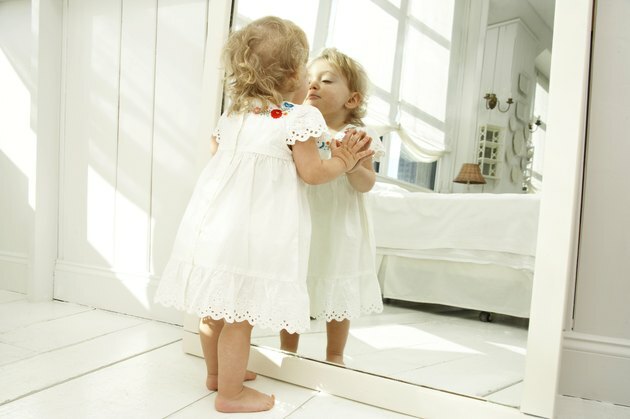 Around 21 to 24 months of age, a toddler should imitate the behavior of others and begin to see herself as separate from others. This age heralds the beginning of increasing Independence and decreasing separation anxiety. Around this age, defiant behavior begins.